With this post I want to start a little series on easy to miss hidden symbolisms on sword fittings. The series will be continued on an irregular basis, depending on when I come across such a hidden symbolism or an ambiguous motif worth being introduced and described in detail. The series surely is not meant to be smart aleck even if I will point out “wrongly“ papered fittings or descriptions from time to time. Well, I put the term wrongly in quotation marks as a description of a motif according to what you see is of course not wrong, even if the artist meant something different, hidden. But more on that later. Aim is on the one hand to provide a little reference for those who own sword fittings with an unclear and/or ambiguous motif, and on the other hand to sensitize collectors for hidden symbolisms. And with hidden I mean really hidden, i.e. in this series I will refrain from introducing widely known hidden symbolisms like cherry blossoms on running water referring to the Yoshinogawa subject and the like. Our first easy to miss hidden symbolism is a motif called hashitomi (半蔀). 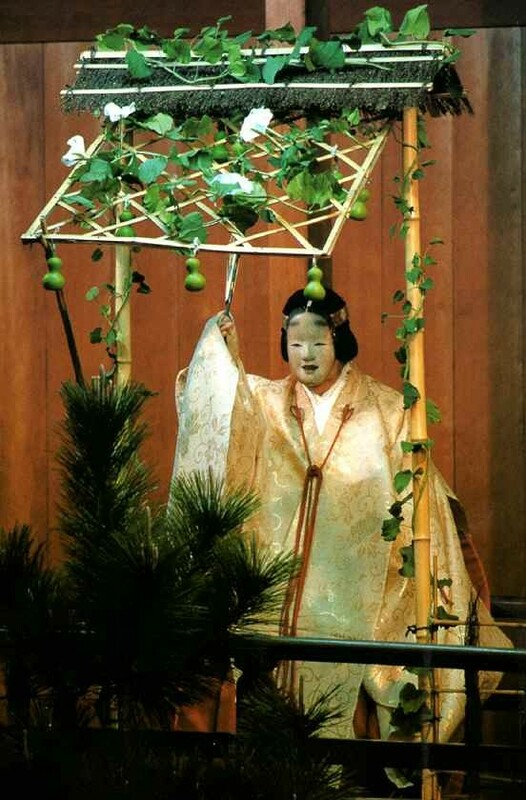 Hashitomi is the title of a Nô play which is said to go back to Naitô Tôzaemon (内藤藤左衛門). It is a complex reference to the Yûgao chapter (夕顔) of the Genji-monogatari in which Genji has a short and sad romance with an lady of the same name Yûgao. Yûgao had once been the mistress of a noble officer but whose wife was against this affair and so she had gone into seclusion with their her and the nobleman´s daughter but where she was suddenly possessed by an evil spirit and died. Genji was informed about that background only after their affair. Now in the Nô play Hashitomi, a monk living in the Unri´in temple (雲林院) in Kyôto´s Kitayama is praying to console the spirits of flowers offered to Buddha every day. At the evening of that day, a mysterious lady appears and offers a single but magnificent white flower, a moonflower, yûgao in Japanese. The monk is curious but the lady does not tell him her name, only vaguely where she lived in Kyôto. When the monk learns later from a villager about the story of Genji and Yûgao, he decides to visits the area described by the lady and finds a lonely and old-style house with open shutters (hashitomi, 半蔀) on which yûgao bloom. And indeed, the lady appears again, but tells the monk now the whole sad story and her deep love to Genji and begs him to pray to console her soul. And whilst she returns behind one of the shutters, the temple bells ring and the monks wakes up and realizes it had all just been a dream. So far the Nô play and now to the hidden symbolism in sword fittings, in our particular case found on sukashi-tsuba which depict centrally a large gourd which takes almost the entire ji. The reference to the Nô play Hashitomi goes namely back to Matsumiya Kanzan´s (松宮観山, 1686-1780) publication Tôban-shôkan-kôketsu (刀盤賞鑒口訣). 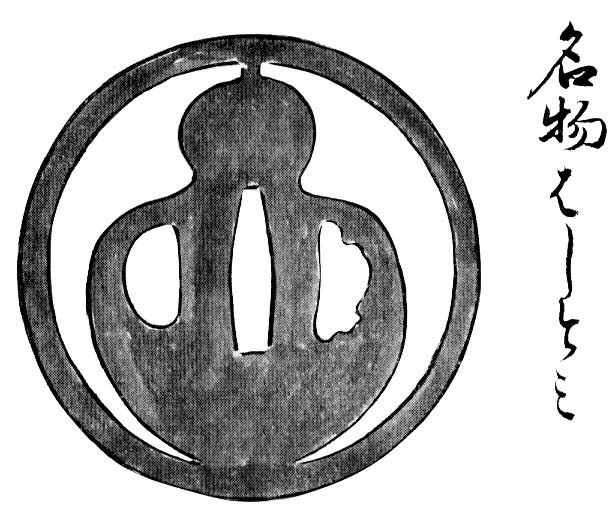 About in the middle of the book we find a drawing of such a gourd sukashi-tsuba (see picture 1) with the brief description “meibutsu Hashitomi” (名物者しと三), “celebrated Hashitomi [tsuba].” So Matsumiya Kanzan has incorporated a tsuba which was famous at his time under the name Hashitomi. But now why the reference to the Nô play and the tragic love story of Genji and Lady Yûgao? Because the moonflower yûgao is a calabash flower and was often growing as ornamental plant on the aforementioned hashitomi shutters. Picture 2 shows such a stylized/hinted shutter as used in the Nô play Hashitomi and picture 3 the actual shutters. 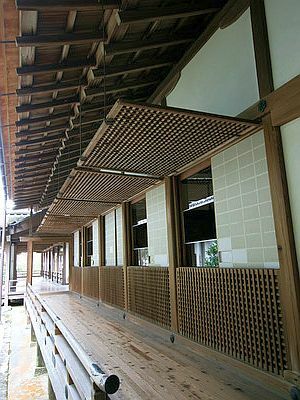 Note that in the case of the shutters themselves, usually the pronunciation hajitomi is used. But we must bear in mind that not every tsuba with a gourd motif is automatically a hidden reference to the Hashitomi subject. This term is namely in the strict sense only used for tsuba interpreted in the manner of the one depicted in the Tôban-shôkan-kôketsu, i.e. in the manner of the celebrated meibutsu whose whereabouts are unknown. So in conclusion it can be said that a sukashi motif of a central large gourd in sukashi should be referred to as “Allusion to Hashitomi” (Hashitomi rusu-moyô no zu tsuba, 半蔀留守模様の図鐔) Or maybe even more accurate would be a description like “Allusion to the meibutsu Hashitomi” (meibutsu Hashitomi rusu-moyô no zu tsuba, 名物半蔀留守模様の図鐔). But of course it´s really not that bad if the hidden meaning is missed as even the NBTHK papers such tsuba as hisago sukashi-tsuba (瓢透鐔, “gourd/calabash sukashi-tsuba”) as seen here. As mentioned at the beginning, “gourd sukashi” is perfectly correct and fine to describe the motif of such tsuba but it is a nice plus to transport all the hidden symbolism with the naming.